AT&T Park, located at the corner of 3rd and King, has been the home of the San Francisco Giants since its construction was completed in 2000. Since its gates have opened, it has become the hub of a brand-new downtown. Eateries, bars, clubs, shops, and other tourist- and family-friendly locations have sprung up for blocks in all directions surrounding the ballpark, and even within it. The “front” of AT&T Park proper is Willie Mays Plaza, a wide expanse of brick and palm trees, statuary, plaques, and two restaurants. One of these restaurants is Public House, which contains a bar and its own entrance to the ballpark. 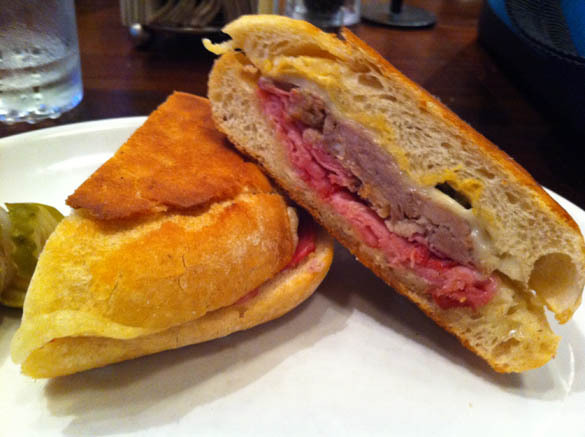 I was pleased to find several sandwich options on the menu, and picked the most intriguing and, I felt, promising option: the Pressed Cubano. The sandwich included both roasted pork and Niman ham, and was augmented by both Provolone and Gruyere. The finishing touch was a few stray pickles, and the complete sandwich was griddle-pressed and served without further augmentation. The end result is a simply fantastic combination of complimentary flavors. The head chef at Public House is a classically-trained chef with a long pedigree, as is often the case with most eateries in San Francisco. I have learned long ago that when you find a legitimate head chef has placed a sandwich on their menu, you will almost certainly not regret ordering one. The sandwich contents all blended together into a delightful creaminess, masterfully offset by the occasional snap of a fresh mild pickle, whose flavor simply added as a grace note to the palate, rather than an overpowering and unwelcome crescendo. The true star of the show, however, was the bread. It was, in a word, perfect. It is a rare gift to find a bread that truly completes the sandwich while providing the perfect containment for the ingredients and an ideal texture for biting through. I was over the moon at having been able to eat this sandwich before a lovely evening of baseball. I only hope that someday, all of you can experience the same. This entry was posted in General Sandwich Discussion, Sandwich Reviews and tagged Pork, Reviews by Bill, San Francisco, Sandwiches I Have Eaten by bengrimm. Bookmark the permalink.